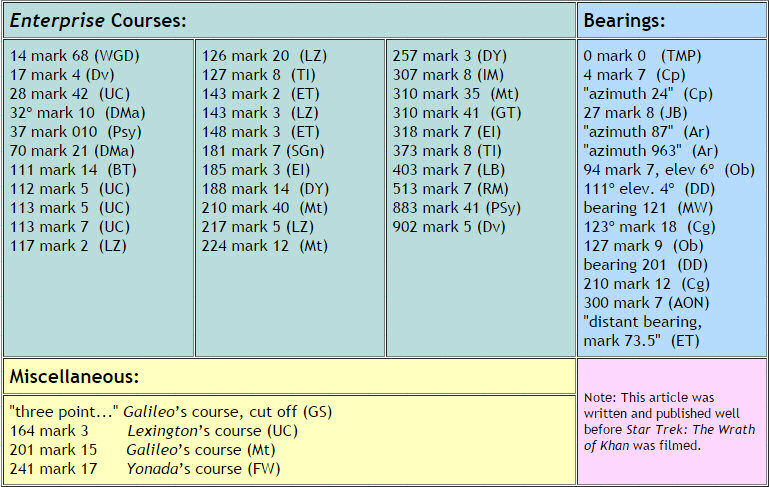 All fans are familiar with references to course and bearings in Star Trek, such as “Mister Sulu, come to heading 550 mark 3” and other similar lines. However, the system behind these references has never been correctly or completely explained. Without going into an immense amount of detail, I shall explain the system and offer some proof to back it up. Obviously, courses are stated as a pair of angles, a latitude and a longitude. These two numbers completely describe the vector along which the ship is traveling. To see how this is so, imagine yourself at the center of a great hollow globe. By stating the latitude and longitude of that point, you can uniquely describe the direction in which you’re traveling, motion in one and only one direction will have you moving toward that point. Note that this is not a statement of position, only a direction of motion. There are three things evident in the table. First, the first angles vary over a much wider range than the second ones do. Since any given star could be at any longitude from your position (there are stars all around us), but stars are confined in latitude to the disk of the galaxy (the Milky Way), it is obvious that the first coordinate is the longitude while the second, more restricted one is the latitude. Second, there are longitude values over 360 (sure, you can blame Freiburger, but that doesn’t make them go away). Since the highest used was 902, I have decided to divide the circle into 1000 which allows it to fit right, in with our beloved metric system. Third, there are no negative latitude values, If the system was arranged like Earth’s latitude and longitude, you would expect an equal number of positive and negative latitude values. The chances of getting no negatives in our sample is between 4.29 billion and 2.25 quadrillion to one. Obviously, the system is arranged so latitude is never negative. From any position within the galaxy, it is fairly easy to plot courses. Imagine a plane parallel to the plane of the galaxy, but passing through your position. This is the “equator.” “Up” will be the direction of the galactic north pole (N.G.P.) determined by astronomers. Draw a vector from your position in the direction that the nearest point on the edge of the galaxy is from Earth. This is the “zero vector.” Longitude of any direction is measured counterclockwise from this vector. Once you have found the longitude, the latitude is measured “down” from a line inclined 25º to the “equator” plane. Thus the latitude of a stellar destination, most likely located in the disk of the galaxy, will be between 0º and 50º. Latitudes run from 0º to 275º (straight down) and from 775º (straight up) to 1000º (equivalent to 0º ). Just as Earth latitudes are never greater than 90º or less than 90º, these latitude values are never between 275º and 775º. Bearings to objects are found in exactly the same way. They are tied to the galaxy like courses are, and the orientation of the ship does not affect them. The ship could spin around in a circle, but the bearing of a stationary object would remain the same. Thus, the bearing of an object in the ship’s line of flight would be equal to the ship’s course. This arrangement greatly simplifies the coordination of sensors, helm and fire control. It also ties in with the use of the “navigation map” at the center of the helm. This device displays the region surrounding the Enterprise constantly, with the ship represented by the center of the map at all times. The stars and objects on the map are constantly moving in the opposite direction as the ship, keeping its position updated. If you remember or watch the final scene in “Arena,” you will see that this is so by Sulu’s comments. In any case, the bearings of and therefore courses to any objects are quickly obtainable by noting the object’s position relative to the circular longitude scale which encircles the map. Some of you may remember (rare) references to a 360° system, such as “a 360° scan” in “The Mark of Gideon” and “180º about” in “The Galileo Seven.” This is not necessarily an inconsistency, but instead, just another of the many 20th century “throwbacks” encountered in Trek as a result of the conservatism of the members of Starfleet. These terns have, through many years of use prior to the adoption of the 1000º system, become synonymous with a “complete circle” and “about face” respectively. This changing of the language is a natural thing, and has been seen in the past. It can also be used to explain such apparently inconsistent and anomalous terms as “quadrant” used in the original Star Trek. Well, there it is, an example of how a pile of research, a little luck and some logic can build up consistent background material which fits the Star Trek universe in every way. Live long and prosper, and happy navigating!